In the P-0 (0-1 year old) classroom, we offer an atmosphere rich in stimulus and learning opportunities which favour an optimal development of the child. The English Bilingual Plan P-0 “Robin Bird” (green), is carried out globally in all of the development areas. Providing stimulation to a child does not mean accelerating their development nor their independence, but identifying and strengthening their abilities, respecting their natural rhythm of maturity and leaning, acknowledging that the children are in an evolution process. We offer a creative and flexible methodology through stimulation in corners, where the children under guidance of the proposal of the activity learn to observe, explore, manipulate, experiment, discover, create and to relate to their companions and educators….always leaving space for creativity and imagination. Our plan for 0-12 months is based on the freedom to choose, on discovery and investigation, encouraging the child to take an active part in building their knowledge. It has a three-monthly evolutionary structure and deals with maturity and individual characteristics of each child.It is essential to show respect to a child’s needs and routines related to feeding, hygiene and rest. The motor area refers to the ability a child has to carry out gross motor skills (with arms, legs and head), as well as to coordinate more fine motor skills. The activities in Gross Motor Skills are essential at this stage of development, because they put at stake all the body movements of a child to achieve adequate positions which favour their balance as well as the necessary skills for independent displacement. The activities in Fine Motor Skills exercise the control and coordination of a child in his/her tactile abilities, that is to say, the movement of their hands and fingers in gradual activities which go from passive to active. The motor corner of the classroom allows us to carry out activities which are adapted to the characteristics of all of the children in the group. Here we encourage free movement, changes of position, their first steps…. Using individualized course material and activities so each child achieves an optimal development of his/her psychomotor activity. Moreover, we activate the learning processes related to the organization of space, attention, and sharpness of their visual and hearing perceptions, visual and hearing memory and the related motor coordinations. The cognitive-perceptive area takes the intellectual ability of a child to resolve a problem into account and includes the role of learning, memory, language and understanding and the ability to differentiate and classify objects according to their shape, colour, and size, among others. This is a stimulation method based on showing units of information called “intelligence bits” in a continuous and organized way (visual information cards), while naming the image they represent aloud. “Units of information which are presented to children in an adequate way. Their exact use is carried out by using an illustration or very precise drawing or photograph and this together with a hearing stimulus, which consists in saying aloud what the picture represents”. In this way children learn without being aware they are learning, picking up new terms and meanings, orders and structures which will help to develop and increase aspects of their development, such as concentration and attention abilities, vocabulary and memory, among others. With our “Chest of Treasures” the children develop their spatial intelligence, their mathematical thought, language and creativity, exercising their fine motor coordination and their ability to observe and analyse when discovering the shapes, sizes and characteristics of the objects as they explore them. For this we use stimulating, attractive and safe everyday objects. The activities carried out on the digital board form part of our Centre Education Plan. In the 0-12 months stage the activities are focused on sensorial (visual, hearing, tactile) and cognitive stimulation with the aim of supporting evolutionary processes and motivating learning. The Story Corner is there to favour children’s oral expression. 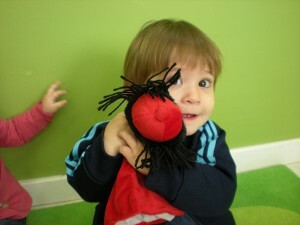 We use specific materials for this: Stories, images, puppets, etc. of different textures, sounds and colours which enables children to accomplish a progressive sensorial and manipulative discovery. The socio-communication area understands the personal reactions of a child in front of those who surround him/her, to satisfy their physical, affective and care needs. 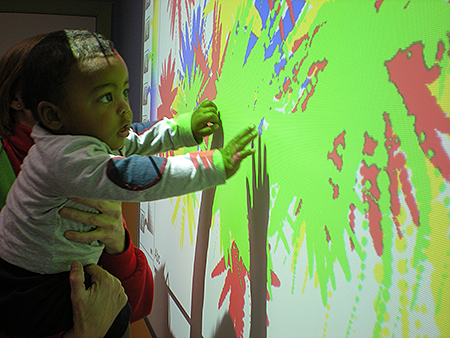 Language development and games maintain a close relation to first life experiences. Both are representations of reality through which a child organizes the world and in this way it is easier for the child to understand. For this reason they have a direct relation to cognitive development. Although babies do not understand the meaning of all the words they hear it is important to talk, read and sing to them mentioning the names of objects and toys and to give descriptions of everyday situations. Listening to language and becoming familiar with it is the first step and one of the most important ones in the learning process. It is usually thought that language development begins when the first word appears, approximately when children are one year old. However, language does not appear from out of nowhere. That first year before the first word appeared is vital for the future development of language and stimulation plays a very important part in it. 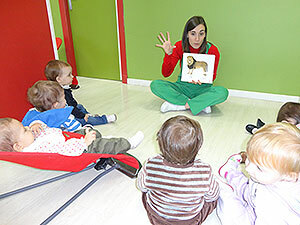 We use a series of games and activities in the classroom to stimulate language, as much as in Spanish as in English, songs accompanied by body movements, naming parts of the body while pointing at them, classroom elements, natural and social surroundings, talking at nappy changing time, while they are eating. Using stories with simple pictures which are easily identified by the babies, plastic telephone, children’s songs, mobiles and dolls or toys which send out noises, rattles and bells; stimulation of the mouth-face organs through practices carried out in our mirror corner, etc. We consider music to be an essential element to achieve an affective, sensorial, intellectual and motor balance. The activities are designed so children can develop their sensibility, memory, attention, concentration, coordination, body language, gross and fine motor and also offer resources which invite children to relax depending on the melody.We carry out acts for different composers, we discover our body’s sounds and those of the musical instruments, and offer a wide range of musical stimulus, etc. Infant Massage is an ancient tradition inherent in many cultures and is now being rediscovered. It has been clinically proven that love, caresses and affective nutrition have an important positive effect on human development. It is through these sensations which become emotions when a child starts to create his/her impression about the world and it is where their resources will start to unfurl in life and will grow to develop their ability in learning and creating relationships. Of all of these sensations the most important ones, especially in the first years of life are those you receive through touching, through this great organ which covers us called skin. Infant massage is included in the P-0 classroom (0-1 year old), dealing with the needs and availability of these and not as a combination of movements, but as a form of affective nutrition and sensorial nutrition as it integrates all of the elements to establish bonds: eye contact, voice, smile, games, hands… through these babies will feel loved, listened to and will receive the support and stability they need. Babies are provided with space and time to receive the message: we are listening; we accept you and we are available which are essential to develop their self-esteem.